If you are looking for trendy restaurant and bars and you don’t mind you wallet becoming a bit lighter, check out the Horie neighborhood in Osaka, located within walking distance of Namba, Shinsaibashi and Amemura. Many establishments here offer top-class gourmet cuisine and excellent drinks, and each shop has its own unique style. If you only plan to splurge once when you are in Osaka, come here. One of my favorite restaurant/bars in the area is Cafe Absinthe. It specializes in Mediterranean fusion cuisine (the cooks here are amazing), and it also sports a wide selection of imported European absinthe. Drinking absinthe here was not my first experience, but Cafe Absinthe’s drinks tasted great and nearly had me out cold after two drinks–one straight, one in cocktail form mixed with Midori–despite my huge dinner and relatively high tolerance. Another great thing about Café Absinthe is the food is up to Horie standards, but the prices are quite reasonable in comparison to many other places nearby. The service is also stupendous. 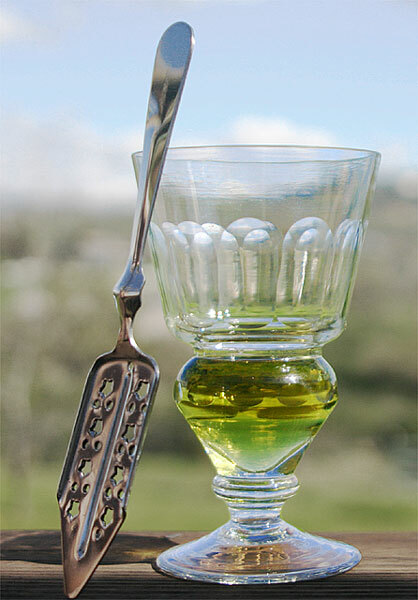 Cafe Absinthe is open from 11:30 am to 3:00 am, every day except Tuesday. It is located a short distance from Nishiohashi Station (Nagahori Tsurumi-ryokuchi Subway Line) or Yotsubashi Station (Yotsubashi Subway Line). The Cafe Absinthe website can be found here (directions are listed, you can look at this Google Maps link).You can call them (06-6534-6635) if you get lost walking from the station (they speak both English and Japanese well).